The witty, incisive and frank memoirs from the legend of Newsnight and long-standing quiz master of University Challenge. Filled with views, opinions and stories from 4 decades in front of the camera. 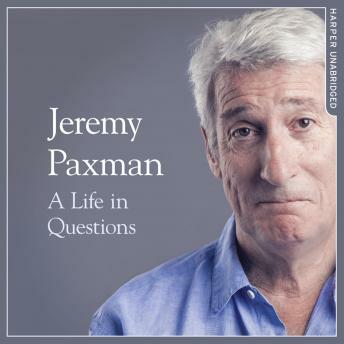 During 25 years as BBC Newsnight's supreme inquisitor, Jeremy Paxman proved himself as the master of the political intervview. From John Major to Theresa May and Tony Blair to Ed Miliband, he has them quaking in their boots. But it wasn't just politicians. Paxman's interviews with Dizzee Rascal, David Bowie, Russell Brand and Vivienne Westwood are legendary. He discussed belief with religious leaders and philosophers, economics with CEOs and bankers, books with writers, and art and theatre with artists. After 23 years on University Challenge, Paxman is also the longest-serving active quizmaster on British television. In A Life in Questions, the tables are turned: the quizmaster answers our burning questions, telling terrifying stories and laughing at much of the silliness in the world. These are the long-awaited memoirs of the greatest political interviewer of our time.